alveolar epithelial cells or both cell types. One day it may be possible to treat a wide range of lung diseases using proteins that direct lung stem cells to grow specific cell types needed to repair the lung injuries involved in the conditions, according to a new study by researchers at the Boston Children's Hospital. Appearing January 30th issue of Cell, researchers led by Carla Kim, PhD, and Joo-Hyeon Lee, PhD, of the Stem Cell Research Program at Boston Children's, describe a new pathway in the lung, activated by injury, that directs stem cells to transform into specific types of cells. By enhancing this natural pathway in a mouse model, they successfully increased production of alveolar epithelial cells, which line the small sacs (alveoli) where gas exchange takes place. These cells are irreversibly damaged in diseases like pulmonary fibrosis and emphysema. By inhibiting the same pathway, the researchers ramped up production of airway epithelial cells, which become damaged in diseases affecting the lung's airways, such as asthma and bronchiolitis obliterans. 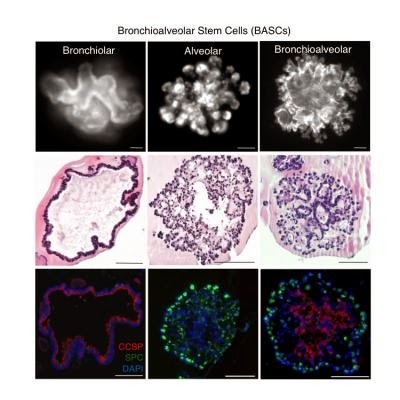 Using a novel 3D culture model that mimics the environment of the lung, the researchers showed that even a single lung stem cell could be coaxed into producing alveolar and bronchiolar epithelial cells. By adding a protein known as thrombospondin-1 (TSP-1) to these cultures, they prodded the stem cells to generate alveolar cells. Kim and Lee conducted experiments using a live mouse model of fibrosis. By simply taking the endothelial cells that line the lung's many small blood vessels -- which naturally produce TSP-1 -- and directly injecting the liquid surrounding the cultured cells into the mice, they were able to reverse the lung damage. Conversely, when the team used lung endothelial cells that lacked TSP-1 in the 3D cultures, the stem cells produced more airway cells. In live mice engineered to lack TSP-1, airway repair was enhanced after injury. 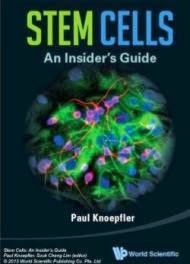 "When lung cells are injured, there seems to be a cross talk between the damaged cells, the lung endothelial cells and the stem cells." said Lee, first author of the study. "We think that lung endothelial cells produce a lot of repair factors besides TSP-1. We want to find all these molecules, which could provide additional therapeutic targets." added Kim, senior author of the study. The research was funded by the Hope Funds for Cancer Research, the National Heart, Lung and Blood Institute, an American Cancer Society Research Scholar Grant (RSG-08-082-01-MGO), a Basil O'Conner March of Dimes Starter Award and the Harvard Stem Cell Institute.